IPL, or Intense Pulse Light therapy, is a non-invasive technology used to treat a variety of skin conditions. IM120’s FDA cleared and patented technology has the unique capacity to treat multiple skin conditions like: fine lines, rosacea, broken blood vessels, age spots, sun damage, acne and acne scars. Intense pulse light is a form of photo rejuvenation. This refers to using light energy and the subsequent heat that it generates to stimulate regeneration of skin and collagen cells. 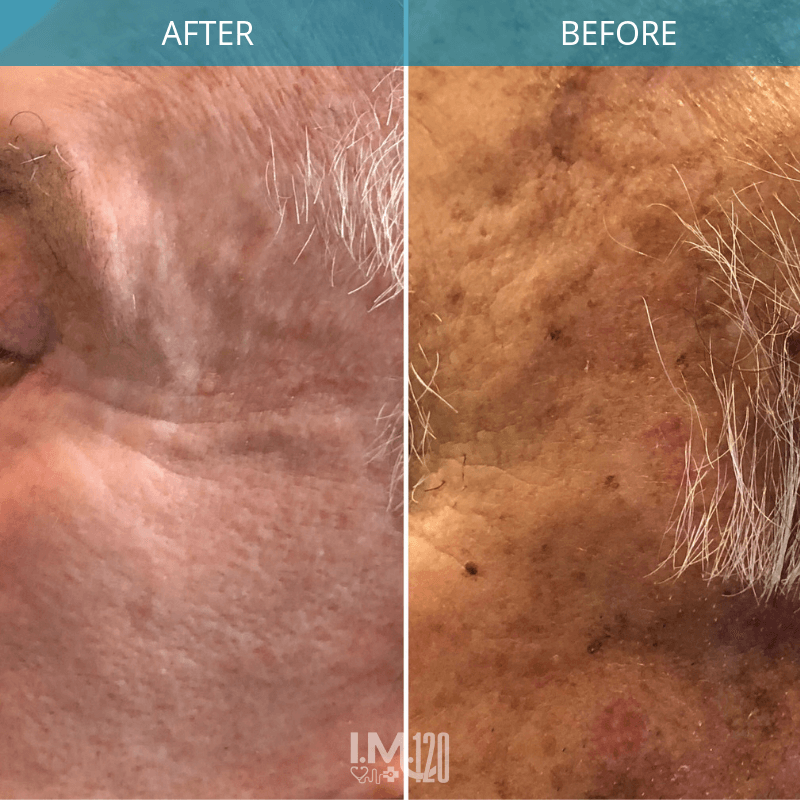 Treatments are most often apply to the face but can also be used on the neck, chest, hands and other places where age spots and wrinkles have occurred. Photo taken one month after 3rd IPL treatment. The procedures work by sending multiple wavelengths of light to the skin surface into the subcutaneous tissue where the collagen resides. This creates a controlled thermal injury that turns on the body's natural healing power. New skin, new and new collagen are stimulated to develop. The result is smoother, more elastic skin with fewer wrinkles and age spots. The benefit is permanent and treatments can be repeated periodically to continually slow the aging process. You will have the option of using a medical grade numbing cream 30 minutes prior to the procedure. Fifty percent of our clients use it, some just feel they can tolerate it. The light feels like a rubber band being snapped on your skin (just being honest with you! ), but it is tolerable when you see the results. The procedure itself is fast, about 10 minutes. You will be slightly pink which lasts for about 30 minutes. Some of you age spots will appear darker. If you have a lot of sun damage, your spots will be more noticeable. You will be able to resume normal activities. Can I wash my face and put makeup on? We recommend not using anything the day of treatment. You will leave with a rich cream on your area of treatment that will aid in the healing process. You should leave that on until the next day at which time you can resume your normal skin care routine. Sunscreen! You just undid years of damage, protect your skin with a wide-brimmed hat, sunglasses and sunscreen. Your first initial IPL’s are done in a series of three. One treatment, one month apart. We recommend following up with quarterly IPL’s after your induction series. What areas can I have treatment on? The face, neck, decollate (chest), hands, arms, stomach…anywhere you have skin that has been exposed to sun. We offer add-on sections to any initial area.